The thirteen stripes on the top half of the flag represent both the original 13 colonies and the rays of the Western sun. The bottom half is the same liberty blue as the U. S. flag. 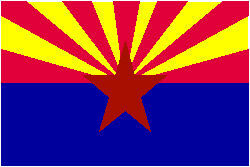 Since Arizona was the largest producer of copper, the copper star was placed in the flag's center. 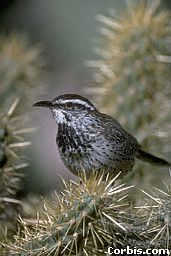 The Arizona State Bird is the Cactus Wren who is quite at home among the thorns of the cacti. Arizona chose the lovely Saguaro blossom (pronounced sah-wah'-ro) as its State Flower. Arizona's State Tree, the Palo Verde (meaning green stick) is most unusual and lovely. In the springtime, it is covered with bright yellow blossoms, but what makes it so unusual is its green trunk. Arizona shares its borders with California, Colorado, Nevada, New Mexico and Utah. Their state motto is "God Enriches", and the awesome beauty of Arizona is proof positive. The State Song is Arizona, and you are not listening to it. All music has been removed from these pages due to possible copyright infringement. So, just hum to yourself as you take the tour. I believe that's still legal. Let's start our tour in southern Arizona. Just click on the license plate, and off we go.